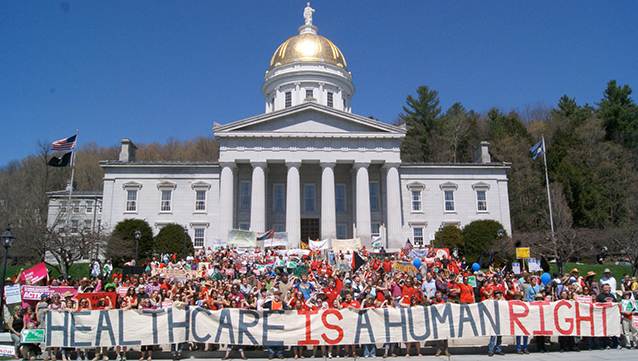 Health care activists rally outside the Vermont legislature. Nurses, teachers, laborers, students, people of various faiths, the undocumented, and so many others joined together to make certain that Vermont’s healthcare system would reflect its values of universality and equity. They were supported by a broad coalition united around a vision to advance Green Mountain Care. Of particular note are the working class Vermonters who told their stories at a series of public hearings hosted by the Vermont Workers’ Center, and those same working Vermonters who gave elected officials the political space and courage to advance single-payer public financing. It was an impressive effort that provided an example of real democracy in action not only in Vermont but for the country. Solidarity is one of over 50 signers of this open letter organized by the Vermont Workers’ Center. You can see the original letter with all the signing organizations listed here. See also this letter from the Healthcare is a Human Right campaign.